In June, two important events occurred in the medical community that could potentially create greater opportunities for RDs nationwide. The American Medical Association (AMA) classified obesity as a disease, requiring a range of medical interventions that includes medical nutrition therapy (MNT). And Congress introduced the Treat and Reduce Obesity Act of 2013, a bipartisan bill that would allow RDs to provide and be reimbursed for intensive behavioral therapy for obese Medicare recipients. This is great news for the nutrition profession! What catalyzed these two events is the ever-increasing obesity epidemic in this country. For the past 20 years, obesity rates have doubled among adults and tripled among children. Research shows that without a continued fight, approximately 50% of adults will be obese by 2040. Obviously, much more work must be done, but RDs stand to make an even greater impact. For the last couple of years, the Academy of Nutrition and Dietetics and other organizations have worked hard to develop legislation that would allow RDs to offer intensive behavioral counseling outside of the primary care setting for obesity and be reimbursed for it. But the dietetics community will have to work even harder to get the bill passed and signed by the president because there’s a slim chance it will make it to the House of Representatives, let alone the Senate. 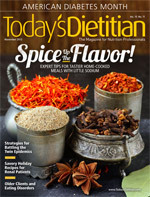 To gain support for the bill, it will behoove RDs in every state to contact their representatives and senators to educate them about the dietitian’s vital role in providing nutrition education and counseling. As RDs, you have years of formal nutrition science education and training, so you’re the most qualified to counsel and offer MNT services to patients who are overweight and obese. Most medical doctors don’t receive the same nutrition education and therefore aren’t the best ones to administer MNT. With greater input from RDs, this country could see a reduction in type 2 diabetes cases, since obesity and type 2 diabetes often go hand in hand—hence the term “diabesity,” which the medical community so cleverly coined. In the article “Battling the Twin Epidemics” on page 28, you can read more about diabesity against the backdrop of the pending Treat and Reduce Obesity Act of 2013 and the AMA’s decision to classify obesity as a disease, and learn how RDs can help transform patients’ lives. Afterward, give us your feedback about the article on Facebook and Twitter. And please enjoy the rest of the issue!